Facebook and Twitter are how millions of people connect to each other on the Internet. You can’t ignore these powerful tools. What better way to market your food truck than leveraging these free and robust social media sites filled with potential customers who can help spread the word about your business! Here are a few ideas to get you started with these awesome social media platforms. 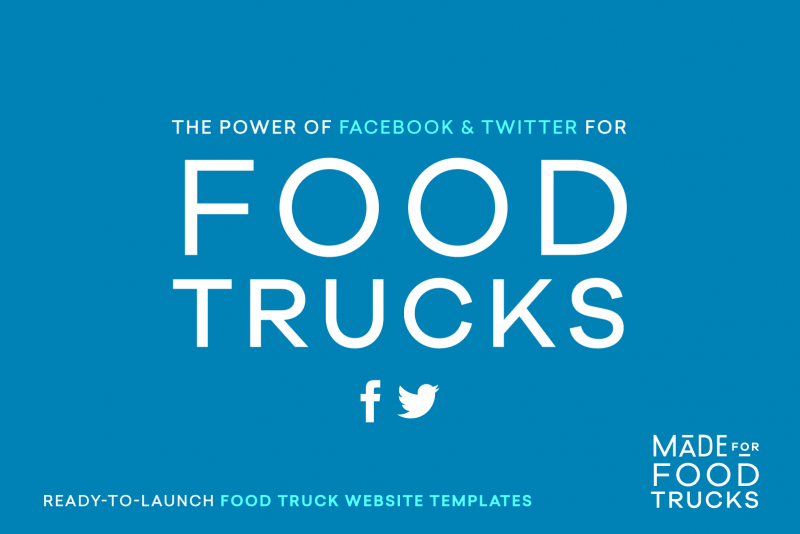 Before you can successfully market your food truck on Facebook or Twitter, you need to build a following. You can offer freebies and incentives for people to follow you, such as a coupon for free food or various discounts for participating in a contest. However, the key to success in social media marketing is engagement. If you want to gain a large, loyal, and vocal base of followers, you yourself need to get involved in the conversation. On Facebook, join groups that cater to foodies, food truck enthusiasts, and local restaurants and – here’s the kicker – participate! It’s that easy. As people get to recognize and know you online, you’ll pique their interest and inspire them to look into what you do. On Twitter follow other food trucks and restaurants in your city, figure out who the tastemakers and most frequent participators are, and start engaging them in conversation. Retweet things these people say and start a dialog. The more you participate with people and show who you really are, the more people you’ll bring over to your side. Part of engaging and interacting with your audience is showing off what you’re up to. Show some personality. Don’t be afraid to post images of your food truck in different locations throughout the city, behind the scenes pictures of you at your kitchen as you prepare ingredients for the day, or a photo you snapped of a happy customer enjoying your food. Encourage your followers to interact with you and your posts by asking questions. For example, if you’re serving up Thai cuisine from your truck you could post an image of two curry dishes and say, “Food Fight! What do you like better? Red or Green Curry?” This doubles as a way to show off what you’re cooking and gets your followers to interact. Food truck social media marketing doesn’t have to feel like marketing and it really shouldn’t. Your customers and followers should be made to feel like they’re involved with the conversation about your food. Entice them into action by making them feel like they are a part of what you do. A follower who feels like they have a stake in your success will be the first one to share or retweet something you’ve posted. Once you’ve built an active fan base of followers on Facebook and Twitter, one of the most powerful ways a food truck can market itself is by letting people know where they are and where they’re going to be. But don’t just make it about you. These platforms make it easy to get other people, businesses, and organizations involved as well. On both Facebook and Twitter you can tag others by their usernames, alerting these people or organizations to the fact that you’ve mentioned them and alerting their own followers. If you have plans to be at a farmer’s market this weekend, posting about your schedule and tagging the farmer’s market can expand your reach, engage more people, and prompt shares and retweets. Promoting others in addition to promoting yourself is a great way to inspire others to rebroadcast your posts and give you a signal boost. The farmer’s market will love the shout out and will most likely share or retweet your post, getting your message out to a completely separate but interested audience. The absolute best and surefire way to leverage social media marketing to your advantage is to get involved in the conversation, let your people know that you’re a real person, and focus on engagement of your followers. You’ve got to put the “social” in social media and that involves being an active voice in the community. You can’t simply post ads and expect to go viral. To really leverage the power of social media marketing, you’ve got to give something to get something.